Chisum (1970) starring the legendary John Wayne is one of our Top 100 Westerns. 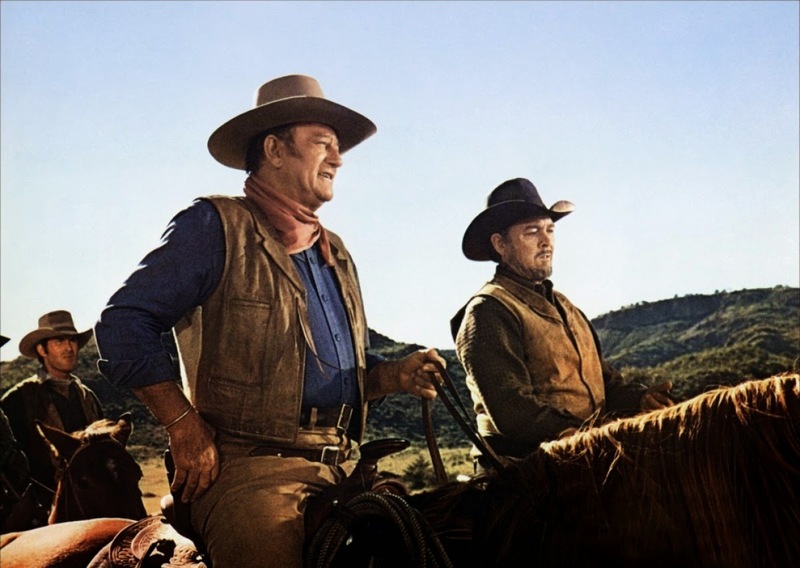 Chisum, a 1970 film about a peace-loving cattle baron who is forced to fight for his rights, stars the legendary John Wayne in the twilight of his long career. More than any other actor, Wayne shaped and defined the American Western. By the time he made Chisum, the 63-year-old Wayne was a mythic onscreen presence: the living embodiment of the Western hero. 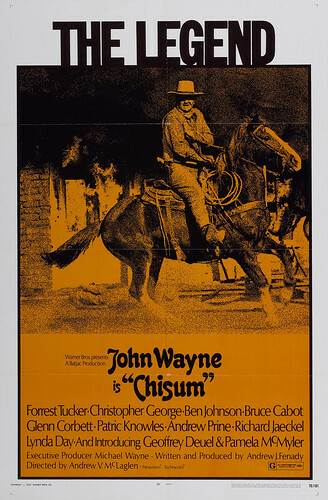 Wayne's iconic image alone was enough to sell Chisum (1970). Wayne began life rather inauspiciously for an all-American hero. He was born Marion Michael Morrison on May 26, 1970, in Winterset, Iowa, to a struggling pharmacist and his wife. Wayne's ne'er- do-well father eventually located his family to California and Wayne became a top football player at the University of Southern California until he was sidelined by an injury. To make ends meet, Wayne took work as an extra and errand boy in the burgeoning movie industry. John Wayne and Ben Johnson in Chisum (1970). Wayne's good looks and easy charm soon led to appearances in front of the camera. He was rechristened "John Wayne" for the big-budget Western, The Big Trail (1930) but, after that film flopped, Wayne was mired in extremely low-budget Westerns where he was often forced to play a "singing" cowboy. Director John Ford saved Wayne from the cheapies by casting him as the Ringo Kid in Stagecoach (1939). Wayne never looked back: He spent the next three decades making some of the best Westerns ever produced in old Hollywood. 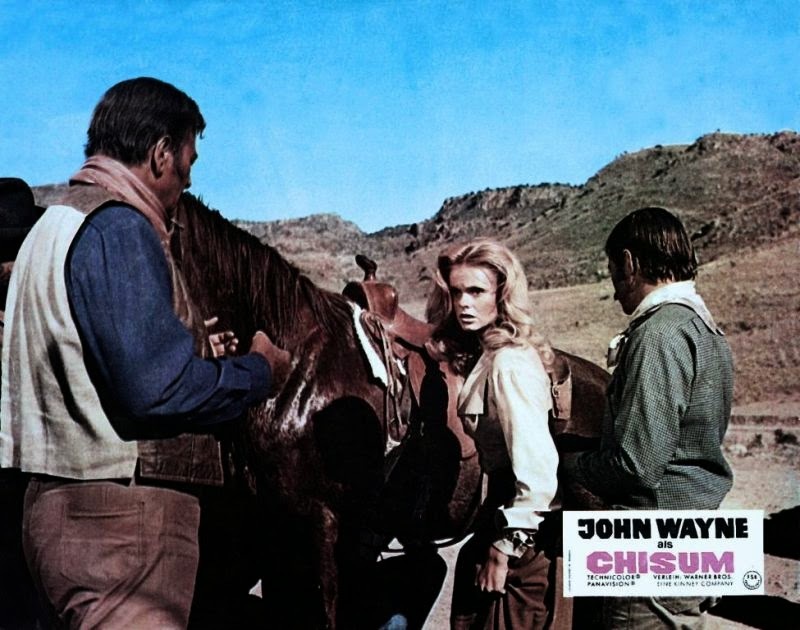 John Wayne, Lynda Day and Glenn Corbett in an ad for Chisum (1970). 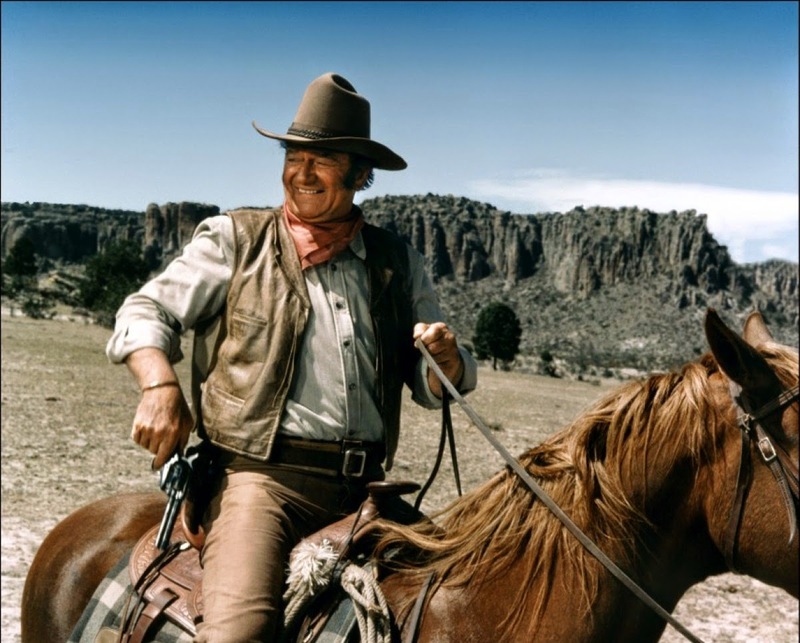 Chisum, ably directed by Andrew McLaglen, trades on audience's familiarity with Wayne's well-established persona. Wayne plays John Simpson Chisum, a real-life New Mexico cattle baron. The inventive opening credits (video below) explain Chisum's background. After a hard life on the range, Chisum is looking forward to a comfortable life of doting on his niece (Pamela McMyler) and squabbling with his old buddy, Pepper, played by Ben Johnson (seriously, he and Wayne bicker like they're an old married couple). Then, a nefarious businessman (Forrest Tucker, who brings the oily villainy with his usual flare) begins to take over the town and steal cattle. Chisum is based on real events surrounding the 1878 Lincoln County War in New Mexico. The War was a complex and bloody feud between rival cattle gangs that only ended after intervention from the federal government (the documentary below has much more detail). The historical events force McLaglen to grapple with a vast array of characters and motivations, which leads to the film being somewhat confusing for audiences. The only characters who stand out are those whose screen personas are well-established (Wayne, Johnson, Tucker) or those characters who are widely known to history (Billy the Kid, Pat Garrett). The real joy of Chisum is watching the actors, many of whom are Western veterans, go through their paces. Chisum can feel like old home week for Western and Wayne fans. Wayne and Johnson, so good together in She Wore a Yellow Ribbon (1949), are still great fun to watch 21 years later. John Agar, another veteran of Ford's cavalry trilogy, appears as store-owner Amos Patton. In fact, director McLaglen was the son of actor Victor McLaglen, who played an assortment of drunken Irish officers in Wayne Westerns. Chisum is available on DVD and video on demand. Next week, Spencer Tracy and Katharine Hepburn are home on the range in Sea of Grass (1947). Last week's Western, The Angel and the Badman, is here.